Type S Seeker Independent Mining Ship "Free Fall Lady"
Type S Seeker Independent Mining Ship "Free Fall Lady" gives you one of the most common varients of the Scout ship that is found throughout know space. The Seeker removes half the staterooms and brings the fuel tank down to a more modest twenty four tons. 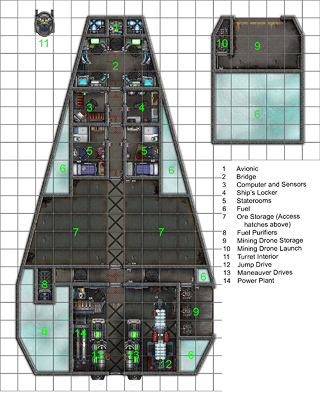 This independant mining ship carries ten tons of mining drones, and its cargo capacity is increased to twenty-two tons. These small mining ships scavenge the asteroid belts, looking for deposits of valuable minerals or other salvage. Many Seekers mount a pulse laser in the turret for mining. All deck plans are in 25mm scale. This title was added to our catalog on September 15, 2013.